Looks like it not only Dennis Chamberland's Aaron Seven who is taking world wide disasters seriously. The Doomsday Vault described below should be able to handle the Quantum Storms and anything else Aaron has to face. Although doomphile SF author Stephen Baxter would destroy it in about two paragraphs. More about the Global Crop Diversity Trust and the Vault here. 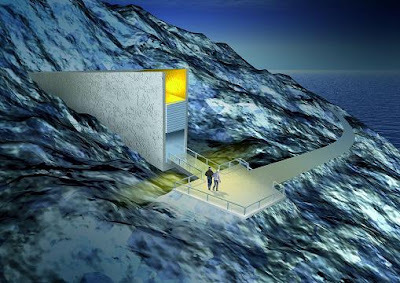 Science Daily — The Norwegian government has revealed the architectural design for the Svalbard International Seed Vault, to be carved deep into frozen rock on an island not far from the North Pole. The entrance to the "fail-safe" seed vault will "gleam like a gem in the midnight sun," signaling a priceless treasure within: seed samples of nearly every food crop of every country. The vault is designed to protect the agricultural heritage of humankind -- the seeds essential to agriculture of every nation. "This design takes us one step closer to guaranteeing the safety of the world's most important natural resource," said Dr. Cary Fowler, Executive Director of the Global Crop Diversity Trust, which will co-fund the vault's operations and pay for the preparation and transport of seeds from all developing nations to the Arctic island of Svalbard. "Every day that passes we lose crop biodiversity. We must conserve the seeds that will allow agriculture to adapt to challenges such as climate change and crop disease. This design is as awesome physically as it is attractive aesthetically, and both are fitting tributes to the importance of the biological treasure to be stored there." "By investing in a global permafrost safety facility for seeds, the Norwegian Government hopes to contribute to combating the loss of biological diversity, to reduce our vulnerability to climatic changes, and to enhance our ability to secure future food production," said Mr. Terje Riis-Johansen, Minister of Agriculture and Food, Norway. The design will accommodate even worst-case scenarios of global warming in two main ways. For one, the vault will be located high above any possible rise in sea level caused by global warming: the vault will be located some 130 metres above current sea level, ensuring that it will not be flooded. This puts it well above a seven metre rise that would accompany the melting of Greenland's ice sheet, or even a 61 metre rise that could accompany an unlikely total meltdown of Antarctica. "Even climate change over the next 200 years will not significantly affect the permafrost temperature," says project manager Magnus Bredeli Tveiten, with Statsbygg, the Norwegian government's Directorate of Public Construction and Property. In contrast to this utilitarian interior, "the exterior structure shoots out of the mountainside," Tveiten said. The entrance portal will be a narrow triangular structure of cement and metal, illuminated with artwork which changes according to the special lighting conditions of the Arctic. In the summer months, the entrance "will gleam like a gem in the midnight sun," Tveiten says. Throughout the dark winter, when the sun never rises, it will glow with gently changing lights. The design also reflects of the project's approach to security. "We decided early on that there is no point in trying to hide this facility from the public," Tveiten said. "Instead we will rely on its presence being well-known in the local community, so if the public sees something suspicious, they will react to it." Riis-Johansen emphasized the vault's importance to the world community. "From a global perspective the emphasis is on assisting developing countries by offering a safe haven for their valuable biological material. I also hope that the interest that is shown in the Svalbard Arctic Seed Vault will create increased awareness for the need for conservation and sustainable use of our genetic resources....."